This center fielder aims at the effective project promotion by the joint use and develops a study along three programs. 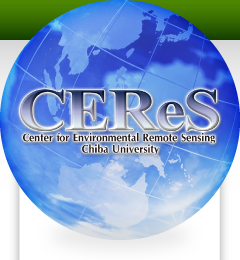 Center for Environmental Remote Sensing (CEReS), Chiba University, has continued to research according to the second middle-term (2010-2015) plaln of Chiba University, from April 2010, as one of the national centers for joint usage and research. Currently the major research projects of CEReS are implemented in line with the following three research programs. Innovation in remote sensing technology and algorithm. Advanced application of satellite remote sensing. Program for global warming and utilization of weather and ocean information. The summary and middle-term targets of each program are shown in the following. The limitation of existing approaches has often been recognized in the course of the Earth environment studies using remote sensing. In this program, novel sensors and algorithms are explored in order to establish remote sensing methodologies that enable more in-depth and comprehensive analyses of various targets including vegetation and atmosphere. In this way this program aims at the innovation of remote sensing through such activities as construction and operation of next-generation satellite sensors, and the integration of wide spectral-range observations using optical and microwave remote sensors. Josaphat Tetuko Sri Sumantyo (Professor)：Josaphat Lab. Environmental applications of circularly polarized synthetic aperture radar (SAR) data/ preliminary design of SAR onboard unmanned aerial vehicles, airplanes, and small satellites. Development of microsatellite GAIA-I for ionospheric monitoring. Development and validation of algorithm for retrieving greenhouse gases from satellite-borne sensors. Development and practical application of novel remote sensing devices that enable innovative data acquisition. Atmospheric sounding by combining satellite and ground-observation data. Activities for next-generation Earth observing satellite GCOM-C: Establishment of validation methods for the visible and near-infrared data/algorithm development for the GCOM-C standard products including biomass index, water stress index, shadow index, and vegetation roughness index. The goals of this program are the integration of wide spectral-range observations using optical and microwave remote sensors, and practical applications of innovative remote sensing to global and regional problems. Development of unmanned aerial vehicle and small satellite for microwave remote sensing and their application to Earth observation. Feasibility study of air pollutant and other atmospheric minor gas retrieval from geostationary satellites. Information retrieval of environmental information by means of next-generation satellite-based and ground-based sensors, especially aimed at the atmospheric and vegetation monitoring. 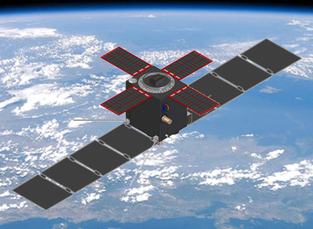 Implementation of validation and various data applications of the next-generation Earth observing satellite GCOM-C.
CEReS develops several advanced microwave sensors for unmanned aerial vehicle, aircraft, and microsatellite in order to observe earth environment. The original sensor is circularly polarized synthetic aperture radar (CP-SAR) to monitor global land deformation, electron density - temperature probe (EDTP). In application development, CEReS develops differential interferometric SAR (DIn-SAR), permanent scatters interferometric SAR (PS-InSAR) etc to monitor land deformation and subsidence in several countries. 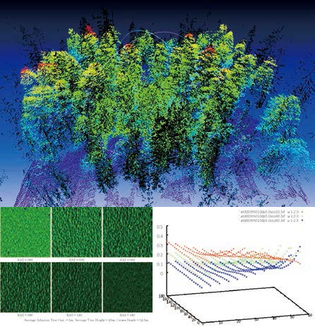 Long-term measurement of CO2 concentration has been achieved by means of infrared light source transmitted over the urban canopy. 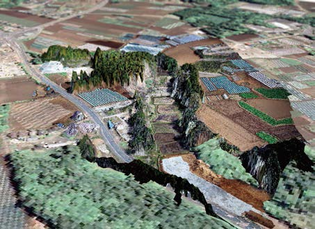 Bidirectional Reflectance Distribution Function (BRDF) simulator has been developed by using ground truth data which are forest structure data by laser and directional radiance measured with spectrometer on UAV. The simulator can be used to estimate global plant biomass by multi-view-angle earth observation data. We have developed an algorithm to retrieve vertical profiles of CO2 and CH4 concentrations from the thermal infrared band of GOSAT/TANSO-FTS. 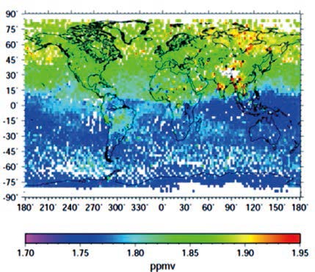 The three-dimensional data of greenhouse gas concentrations retrieved by the developed algorithm can be used to discuss the transport of greenhouse gases from the surface to the upper atmosphere. These data have been released to the public from the following web site: http://www.gosat.nies.go.jp/. This program aims to promote atmospheric/terrestrial environmental studies based on integrated use of geoinformation including satellite remote sensing data, ground measurement data, and extracted environmental data. Main research subjects in this program are correction and preprocessing of satellite data, efficient processing methods for a huge volume of satellite data, environmental monitoring method by integrating satellite data and ground data, and extraction of atmospheric/terrestrial environmental parameters. This program has close relationship with the operation of the data distribution and sharing systems of the whole CEReS. Atsushi Higuchi (Associate Prof.)：Higuchi Lab. Hitoshi Irie (Associate Prof.)：Irie Lab. Naoko Saitoh (Associate Prof.)：Saitoh Lab. Archiving global data of geo-stationary meteorological satellites for more than 10 years, with validation, high-level analysis, and data publication. Feasibility study for the seamless monitoring of the atmosphere by means of comprehensive analysis of satellite data that enables the profile retrieval of atmospheric parameters. Production of advanced and highly precise datasets for global tree coverage and land coverage. Development of a basic geoinformation system, "CEReS Gaia", for efficient data accumulation and sharing. Long-term climatology analysis is implemented by means of the seamless monitoring over more than 20 years, leading to the synergy of land and atmospheric studies and realization of the information center for the earth environment. Long-term seamless monitoring of the atmosphere is employed for climatology study, through the high-level analysis of various earth-observing satellites, especially geo-synchronous meteorological satellites. Invigorating the atmospheric and land-surface studies through the feedback of the knowledge from the seamless monitoring to the data pre-processing such as calibration and atmospheric correction prior to the land-coverage analysis. The final goal of this program is the formation of the information center for the earth environment by disseminating the data obtained from this program and other CEReS programs. 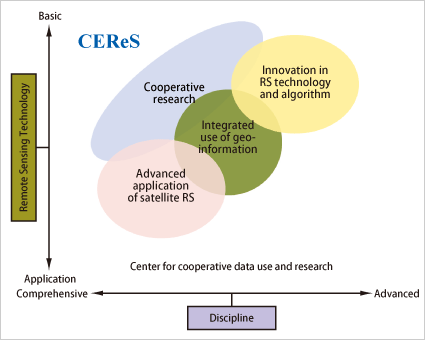 The international geospatial data sharing system, "CEReS Gaia", will promote terrestrial environmental research by integrating existing data and research products through mutual comparison activities. 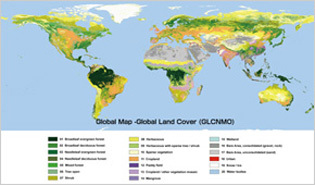 Global land cover data with 15 arc-second (approx.500 meter at the equator) were produced by MODIS data in the framework of Global Mapping (GM) project, and published the data through the website of GM project and CEReS. Geospatial data sharing/overlay system CEReS Gaia was activated in 2012 and updated in 2014. The system is linked with University of Indonesia and other research institutes. CEReS has been operating data active archiving centers (DAACs) for research communities. A portal interface is also available for users, of which describes released data format, server's URL, etc. Since 2013, integrated research named "food security package" has been promoting. Food security package is the integrated use of fine-time resolution satellite products EXAM (short-wave radiation) and GSMaP (precipitation) as forcing data' combined with integrated land-surface model SiBUC and plant growth model SIMRIW. An advanced ground-based remote sensing system (MAX-DOAS) was newly installed at CEReS in 2012. Continuous observations by MAX-DOAS at several sites including Chiba University were conducted. In addition, the instrument and algorithm were revised and improved in a large scale. 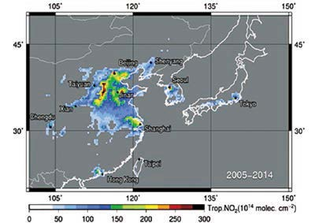 Spatiotemporal variations in tropospheric nitrogen dioxide over East Asia by 2014 could be clearly analyzed by satellite data based on validation comparisons using MAX-DOAS. Since the establishment of the "Aerospace Basic Act" in 2008, the major purpose of the national policy over the space development and utilization has changed from the stage of research and development to that of wide-range, practical utilization. Thus, it is absolutely needed for the environmental remote sensing community to establish the methodology of utilization of remote sensing for finding, understanding, and solving various problems on both scientific and social bases. In view of such background, this program (Program 3) aims at assigning important problems that must be solved on national and global levels, integrating the results of satellite and ground-based observations, and realizing the advanced application methodology of satellite remote-sensing data through the synergetic activities of scientists representing various fields of environmental monitoring. Researches on environmental changes in China. Evaluation of ecological services of hydrologic cycle in the Quaternary uplands (collaboration with Chiba Prefecture). Extraction of spatial information in relation to the biodiversity (collaboration with Chiba Prefecture). Formation of database useful for the mitigation of pollen influence on human health. Research on web-based dissemination of spatial information. Construction of environment-friendly food production support system for adaptation strategy to climate change. We plan to produce novel application methodology of satellite remote sensing data in combination with the data obtained from ground observations. The targets will include various problems such as desertification, water problem, food security, evaluation of ecological services, urban and rural planning, etc. Monitoring and causal analyses of environmental changes in Asia. Restorations of sound hydrologic cycle and biodiversity in Chiba prefecture. 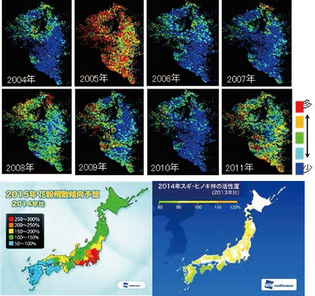 Study on spatial information system that nurtures the disaster- and environmental literacy. Construction and provision of spatial information helpful to our daily life. 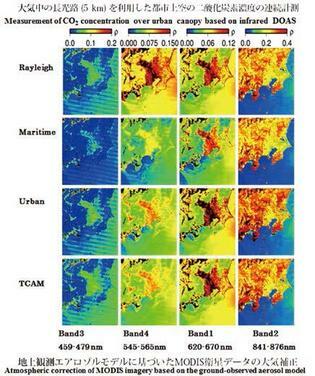 Monitoring of environmental changes and disasters in Asia by satellite remote sensing were enhanced to establish holistic understandings of human and physical dimensions of regional environmental changes in Asia. Realization of transdisciplinary in environmental issues was attempted by employing remote sensing and GIS effectively. Cooperation with stakeholders was formed in Inbanuma Watershed, and Fukushima district to restore healthy environments. 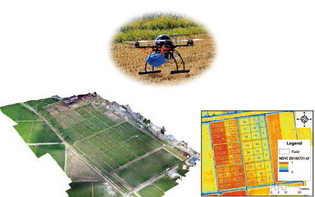 On demand remote sensing was developed by using UAS(Unmanned Aircraft Systems). 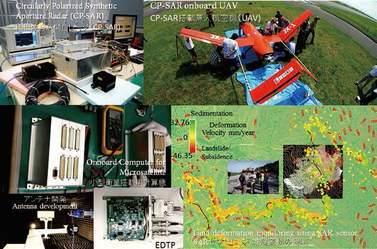 Creation of ortho-aerial photos, measurements of air temperature, humidity, dose rate, surface temperature, and application for farming activities were established. New prediction method of pollen scatter potential was developed by using meteorological data, the amount of cedar male flower and MODIS/fPAR. MODIS/fPAR image can be converted into an activity index of the cedar forest, that is the higher this index increases, the more amount of male flower cedars would be expected. The Weather News Inc. in Japan made use of this method, starting the pollen scatter forecast program on TV. The information provided through this TV program is useful for many people suffering from pollen allergy and also companies making products related with this disease. 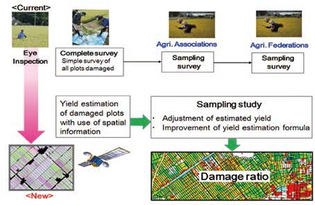 New method of damage assessment through estimation of rice yield was formed by spatial information. This method can substantially contribute to reduce the time, costs, and man power which are necessary for implementation of the agricultural insurance. From perspective of the food security, the agricultural insurance is considered to play a key role to realize sustainable agriculture, consequently strengthening the social infrastructure. So this achievement leads to more precise damage assessment, which finally could help the whole world to be converted into sustainable society.